It’s hard enough to get baseball players at a ballpark to sign a ball. Imagine what it took to get Nelson Mandela or Mikhail Gorbachev’s signature on one, but that’s exactly what one Long Island man has done. “Margaret Thatcher, of course the Iron Lady. Here’s another one that I treasure, too. Angela Merkel. I was very happy to get her. She’s a tough one,” Kaplan says. 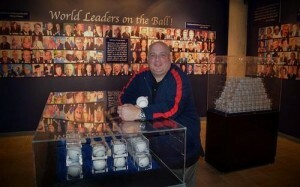 Kaplan has always been a collector: baseball cards and comic books as a kid, movie and rock star autographs as a teen. 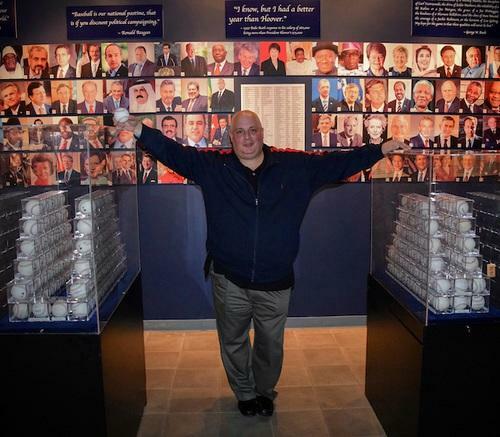 Kaplan, who is Government Affairs Director and Senior Lobbyist with the Long Island Board of Realtors, got the idea for his collection after a chance meeting with former President George H.W. Bush and Barbara Bush at a ballgame, after which he had them sign a scorecard. A short time later, Kaplan was at the Baseball Hall of Fame and saw a collection of balls that presidents had thrown out as a first pitch. That was in 1993. 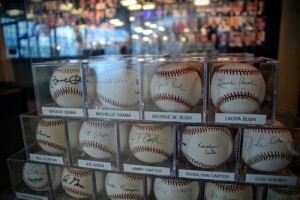 Bill Clinton was the first to autograph a ball in 1996. Since then Kaplan has gotten signatures from some of the most influential people in history, including figures like Nelson Mandela. Getting a signature requires planning, luck, and a little bit of chutzpah. For example, getting Gorbachev to sign, Kaplan went to a book signing with a baseball and a phrase in Russian he memorized phonetically. Who’s currently on Kaplan’s most wanted list? The Kaplan Collection has been displayed at the LBJ, Nixon, Ford and Clinton Presidential Libraries and the Herbert Hoover Museum. Kaplan is not taking any chances: he has signed balls from Hillary Clinton and Donald Trump, and their running mates. 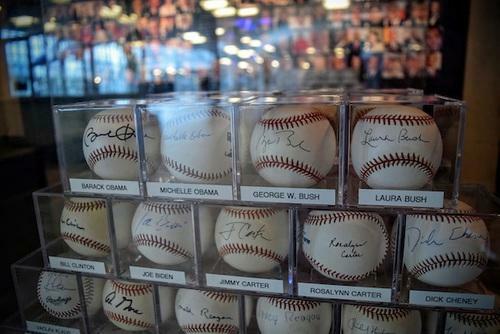 “World Leaders on the Ball” is at the Cradle of Aviation Museum through November 8 – which is Election Day, appropriately enough.